The policies outlined in this document provide the official and mandated direction and approach for all future disaster management activities and programmes. The policy document also serves to communicate and inform civil society including the general public, local and international non-governmental and humanitarian organisations, various government ministries and agencies of Cambodian Red Cross (CRC) disaster management objectives and how it intends to pursue these objectives. The document outlines the guiding principles and basic rules for disaster management. It looks at the fundamental principles in emergency response; principles in disaster preparedness; principles in international disaster relief assistance; and principles of accountability. It then looks at CRC disaster management guidelines, which cover: emergency response; disaster preparedness; integration of disaster management and development; food security and nutrition; refugees and other displaced people; capacity-building and development; psychological support; and gender. Citation: Disaster Management Department CBDP Team (2003, 2005). 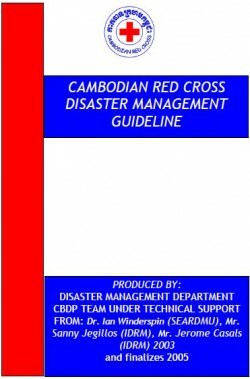 Cambodian Red Cross Disaster Management Guideline (pp. 1-51).